On Monday evening I ran 10km non stop. In fact was actually 10.6km. I am so proud of myself. I never thought I would make it to the end of the road in one piece never mind continuously running for just over an hour. The trouble is now I am a little bit scared to run again. I really want to get out there and I need to keep training for the Race For Life but I am worrying about letting myself down. When I did a 'proud of myself' status update on Facebook I got so much support and kind words from people that I'm kind of feeling overwhelmed. I didn't think I was doing anything special by running but people keep telling me I am a natural as I've only been running a couple of months. I've never been particularly good at anything before and I am scared of failing. People keep suggesting I do 10K races and half marathons but suppose the running I've been doing so far has just been luck? Suppose I never manage 10K again? I don't want to sign myself up for a public race and then embarrass myself. I guess I will just keep running and see how I feel after the Race For Life. Hopefully then I will know if running races are the thing for me. I hope they are. Here is a great photograph of a runner. I love that he is so small in comparison to all the architecture around him. I love the colour and tone the image too. It feels almost like something from the future. It also look like there was no one around for miles. I wonder if this was taken very early in the morning. 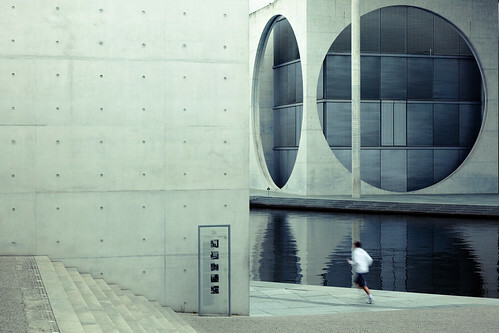 It looks like a really interesting place to run. That's what I love about running. I love using it as a chance to explore the local area. Much more interesting than running on a treadmill!